The Hotel Saint-Andre des Arts is a 1 star hotel in Paris with immense character including traditional stone walls and wooden beams with some parts dating back centuries, yet with modern facilities including en suite bathrooms, free WiFi and much more, this is more like a 2 star hotel. 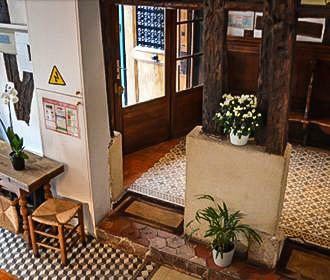 The Hotel Saint-Andre des Arts has a rich history dating back centuries, which has maintained its charm and character including a door dating back to between the 14th and 15th centuries, 19th century tiles on the floor, traditional wooden exposed beams, along with original exposed stonework. The building was constructed on the foundations of the original wall built in the 12th century by King Philippe-Auguste and was constructed in several stages over the centuries until its completion in the 17th century. Therefore you will find ironwork, antique furniture, old paintings and more, that just add to the charm and history of this 1 star hotel. The reception staff offer concierge services such as organising transfers between the airports at preferential rates, along with help organising tours, booking restaurants, etc to make your stay as pleasant and enjoyable as possible. A photocopier, printer and a fax are available for the use of guests, along with a safe at reception, plus there is also a fridge, microwave and kettle that you can utilise, meaning for those of you on a budget you do not have to worry about eating out all of the time. In addition to this, breakfast including fresh bread from the local bakery is served each morning on the ground floor, the same as it has been for centuries, which comes in with the cost of your room. 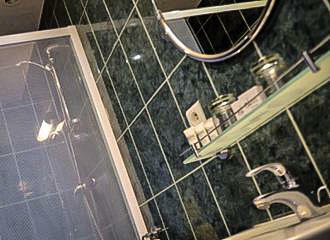 All of the rooms at the Hotel Saint-Andre des Arts have their own bathroom with toilet and shower or bath, plus there is a free WiFi internet access to each of the hotel rooms and a baby bed is available by prior booking at an additional cost of approximately €5 per night. 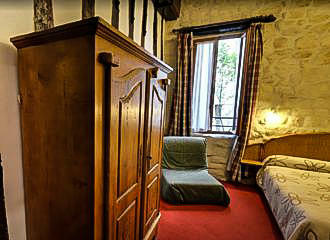 You have a choice of a single, twin or double room decorated in a simple and basic, yet authentic style with stone or half timbered walls and a wooden beamed ceiling. However, this is also a family friendly hotel, so there are also triple and quadruple rooms available, again in the same traditional style of walls, with most of these also having wooden beamed ceilings along with a desk and place for your clothes. Located in the historical Latin Quarter of Paris, the nearest Metro stations to the Hotel Saint-Andre des Arts are the Odeon stop serving Lines 4 and 10 or the Mabillon stop on line 10. Yet a slighter further walk and you would reach the Saint-Michel - Notre-Dame stop which serves Metro line 4, plus this is an RER train station serving the RER B line and the RER C line. Although, if you are travelling to this 1 star hotel by bus, then the bus lines 58 and 70 will get you closest, but the lines 21, 24, 27, 38, 63, 85, 86, 87 and 96 will also take you within walking distance of the Hotel Saint-Andre des Arts.